A manager makes at least 30 important decisions a day. Most of these are far from perfect. Focusing on the right clients, choosing the ideal partners or co-workers, reacting properly in a sales situation, solving a conflict. We make decisions in every minute of every day. Most of these decisions could be better. Why? Because people rely far too much on their emotions, desires or their habits when making decisions. Our training gives a radically different approach to decision-making through Poker. Playing poker and being in a business meeting isn’t that different. You have to make quick decisions under pressure, based on scarce information, about limited resources in an extremely competitive environment. One bad decision and the game is over. One good decision and you take the pot. Our training helps leaders to prepare for and make better decisions. Supported by their emotions, or their rational thinking, depending on which one is needed. The next time you raise the stakes during a meeting – you will know why that is the best decision. That is the essence of Decision control. Conscious business decisions are made with the mindset of a professional poker player. The unique Actionlab factor - Where does the true motivation come from to make behavioral changes? Participants will learn the most widely-used strategy card game: Texas Hold’em. 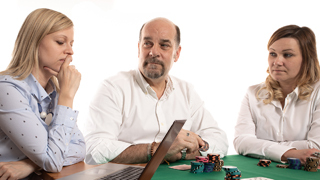 While learning and practicing, they will become acquainted with the business-related strategic elements inherent in poker, thus developing conscious decision-making and system-based thinking – putting the routine and emotional role behind them. We place a lot of emphasis on the subsequent analysis of positive and negative results. We believe in a full-cycle development processes. Our training program covers a number of weeks: include the training day (depending on the program half, one, one and a half or two days), a mini 360 survey, and a few daily missions related to the subject of the training. The aim of the Mini 360 survey is to begin the development desire on the topic. This is to ensure that the participants take part in the program with the utmost openness and efficiency. After training, we will continue to work with special missions for real-world change; they will utilize their new knowledge and do not let any of the old methods creep back from some failures. For the programs, we provide a workbook, which includes the complete theoretical knowledge of the training and the related self-reflection and personalization tasks. Can you guess the number of wasted income opportunities just because there was no “chemistry”? Because the salesperson and the client didn’t “connect”? We live in a time of “similar products”. One salesperson, in many cases, is just like most others. They are prepared to talk about their products and their own companies. They merely recite the USPs by heart, and ask several open questions in a consecutive flow. Most clients won’t remember them after a few hours. The reason for being easily forgettable is simple: they were trained to the good old sales techniques “Feature-Advantage-Benefit” (FAB). One salesperson is just like the other. We developed Attraction Sales for those, who want their team to stand out. Modern customers do not only choose a company because it offers great products. Attraction isn’t a choice. That is the essence of Attraction sales. More attractive salespeople mean more business. Are you born with it, or can it be learned? Attitude-myths, self-confidence and aptitude. What’s in your head? Fear, self-limiting assumptions, managing them, controling them. We are acting all the time! Attractive basic functions: Flame, Spirit, Free. Emotional stimulation, more than information transfer. The secrets of master communicators: storytelling, observation, improvisation. The focus of our training program is attractiion, but it is not our intention to implant behavioral patterns into the personalities of the participants. We are going back to the roots, and we are recalling couple relationships. We believe that attractive action can be learned, but we also believe that every person can become self-sufficient and self-assured in his own way through his or her own unique means. Our goal is that the aur should be natural, and the power of personality obvious. An “average” leader is exposed to dozens of theories at different trainings. Most of them do not become practical, because “life is different than training”. Delegate, feedback, evaluate performance. SMART goals, coaches, professional support, involvement, motivation. Possibly simultaneously. All this has to fit into the work day. One of the ironies of is that it seems much simpler looking from the outside than it really is. In addition, despite the many managerial trainings – participants almost always say, “reality is different”. The leader in the Jungle takes the participant into an exciting environment where we do not pretend to be in the workplace but through the story we bring the excitement of everyday life. The Leader in the Jungle program helps you master leadership skills so that they can truly be used in everyday life. The Leader in the Jungle is a game-based skill-building indoor (unfortunately) training where participants can solve challenging situations through a story framework. The most important goal is to be able to handle situations in real life as efficiently as possible through the learned skills built into the story. Our training has been designed to bring participants along a coherent storyline and meet with the ledership tools they can claim as their own.. However, as there are no two companies that are alike, the storyline is designed so that each subject can be removed and pushed when needed – without the need to see the story as a binding element. The theme is therefore not included in the offer, but lists the optional topics. Depends on the topics chosen. Do you know how to negotiate when your life is depending on it? Do you know when was the last time you negotiated for your life? It might have been yesterday’s business meeting that will have a hitherto unvisible but just as fundamental impact on your life. It might influence the way you’re paying your rent, the way you tutor your children or if it is your name on that promotion bonus at the end of the year. So the question is if you ever negotiated like that and whether if you know what opportunities you have left on the table? Did it ever happened that during a so-called „discussion” you were pressured until you retreated into fierce resistance? Did you wonder if it ever happened the other way around? Often we don’t even realize that we should be negotiatng, because negotiation could be the best way to reach our goals. Instead we automatically lose even the possibility of reaching a better deal, one that can be quantified as valuable time or the improvement of personal and business relations. On the other hand it is quite possible that you realize this when your life is at stake (literally even). However in such a case you will not have tha chance to utilize the methods learned from books. You will have to rely on what you have practiced. And this is where we help you. We believe that in order for such methods becoming skills, you have to practice on actual business issues. We provide coaches who can determine what you need to radically and measurably improve your negotiation skills. We believe less in nuances, much rather in negotiation experts making you face the cold hard facts as well as a safe training environment. This is what Survival Nego Training is about. To turn good negotiatiors into negotiation experts. It does not matter what the negotiation is about. Whoever uses the proper skills buys cheaper, sells at a higher price all the while fraying out better conditions. Such a person knows that you can only strike a good deal using the power of negotiation! No matter if we like it or not, we negotiate every single day. What makes a “good negotiator” and what should I change to become one? The truth is THAT WE NEGOTIATE EVERY DAY WHETHER WE LIKE IT OR NOT. We are engaged in negotiations that have ruthlessly impacted our lives. This can be a yearly negotiation with a partner, a fight for a bonus, an affirmation of interests between corporate departments, or even a struggle to get our child into THE nursery school. Perhaps we could say that our daily negotiations get under our skin and we are routinely negotiating for our “lives”. We believe that within our current social system one of the most important tools for our prosperity is negotiation. Where sales, communication and negotiation efficiency are key. Filling up the the prospect list, qualifying potential targets, contacting cold opportunities, follow up meetings or offers. Usual tasks for a salesperson. The process driven numbers’ game is the foundation of every successful account manager. How about those that are new to the job or working without a systematic understanding of the sales process management? How about those considering sales training as an unpleasant necessity? The Quota method provides a gamificated training program based on the current best practices is sales today. The game is built around the 10 major steps of selling. From identifying a prospect, through to initiating cross and up sales activities. The teams win real prizes that fuel their emotional involvement that will take the new learning points directly into their own practices. If you are the first to hit the bell and give the right answer you receive Quota® dollars and your team gets closer to the main prize. The Quota® method generates engagement towards the most boring but highly needed skill development! Even for non-sales related positions. After the two day course participants will have a deep understanding about moving business forward. Teams being developed together will also have a common language for discussing pipeline activities. Conscious business development knowledge is created through interaction and retention. Quota® is not only for salespeople. Participants learn the Quota board game rules and then group into teams and fight for final victory. While learning and practicing, you learn about each step of the sales process and upload them together with a shared, but personalized content. Particular emphasis is placed on the fact that individual levels and steps can not be left out, even when a sales meeting can solved by a simple phone call, or when we are involved in a multi-stage sales cycle with a company. If the program was preceded by Attractive Sales Training, each Quotagame step is tailor-made for the attractive, charismatic attitude. A sales process is developed with an exciting board game. Have you ever met someone who is a professional at what he does, who has quick wits, but will never be a LEADER? Rarely do we see a leader, who is capable – either privately or in front of the whole team – to inspire and control. Why isn’t it obvious what and how to say to be interesting, memorable and motivating at the same time? The reason is simple: we were not taught how to be charismatic. Neither in school, nor at home. Only a lucky few have seen good examples. We see luck differently than others this is why we developed the Charismatic Leader training. Utilizing the analogy of dating psychology. A leader performs in every single moment. Whether he likes it or not, whether he takes it as an opportunity or a threat, his or her behavior is judged every minute of a workday. The leader of the 21st century recognizes that through self-congruent, charismatic behavior, he can leave a mark in his environment, and that occasionally a single, well-placed sentence can decide about winning an assignment, about the career of an employee, or about the results of an offsite workshop on strategy. Overpassing weak-heartedness, dealing with the unexpected or frightening situations quickly and self-confidently, initiating a light conversation in the break of a conference, answering effectively to offensive questions, and to raise and keep attention for ourselves. That is the essence of Charisma. We perform in every moment. Are you born with it, or can it be learned? Charisma myths, self-confidence and aptitude. Presence: learn to dominate the room, and the loudmouth. Positive energies using inspiration: how to develop a creative atmosphere around us? Meetings done differently: meetings and inspiration. The impressions we leave are largely dependent on us and not on others. To help participants accept this thought, we break charisma into samples we can develop, and then test them in unusual circumstances. Building on the experience we aim to strengthen personal identity charisma. We learn to introduce ourselves, the company, the area, so that the others will remember it. We put story-telling into business negotiations. We have a lot of experience where the participants are not familiar with structured feedback about what impressions they have left behind. Have you ever wondered what what you would have done differently if you knew the real intentions and motivations of a negotiating partner. A salesperson who can not see when it is unnecessary to let the price go down further, or when he doesn’t realize that he has touched upon the customer’s most important topic. A HR employee who does not recognize whether the subject of the job interview has the right motivation. The buyer who is not aware how far he can deal with price or deadline with the supplier. The reason is simple: they have never been taught how to interpret the hidden signs of the real thoughts and feelings of others. The Business Lies training brings the behavioral analysis into everyday business. Through the exciting world of lies and truths. Although the truth is important for everyone, detecting lies is more exciting. That is why we chose lie recognition to support learning behavioral analysis. By the end of the course, with the help of a focused negotiation technique, and with a conscious approach, participants will be be likely able to tell what their negotiating partners are thinking beneath the surface. We learn the signs and meanings of different emotions, feelings, and what can trigger them. We analyze sound materials, live and set videos, perform roles in exercises, and test our new knowledge with skilled actors. Do you know someone who is well-versed in their profession, but no matter how hard they try to pass it over to others, it somehow “does not get through”? We rarely see someone who can fully inspire colleagues or external partners in a presentation. Why is not it clear what to say and how to say it, to make the presentation interesting, memorable and motivating at the same time? The reason is simple: we were never taught either at school or at home how to behave in a charismatic way, to express our thoughts in a fascinating way. The lucky few have seen this through good examples. We don’t wait for luck, so we have developed the fascinating presentation course. The psychology of dating relationships is used in parallel. The impressions we leave are largely dependent on us and not on others. To help participants accept this thought, we break presentation itself and the style of the presenter into pieces we can develop, and then test them in unusual circumstances. Building on the experience we aim to strengthen personal identity charisma. We learn to introduce ourselves, the company, the area, so that the others will remember it. From the company, from the profession we represent, we will speak so that we will impart the impression that we want others to have. We will introduce our business stories into our presentations. There are plenty of exercises where participants will receive structured feedback from unknown people about the feeelings imparted with the presentation. Anyone to whom matters is what happens with the people you present too. H-1022 Budapest, Bimbó út 39. Postal address: H-1390 Budapest Pbox. 153.